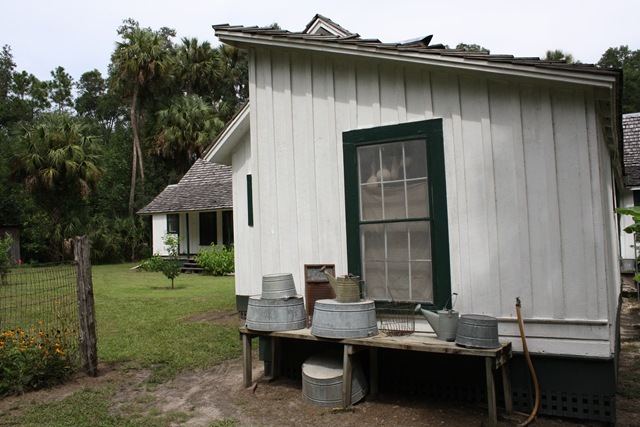 Ever since I read about Marjorie Kinnan Rawlings’s Florida adventures in Cross Creek last spring (recounted in this blog post), I was determined to make a pilgrimage to the author’s former Central Florida home, now a state park bearing her name. Plans began to take shape from Spain through Skype calls with my mother, who shared my enthusiasm. Together, we began to hatch a plan for an Old Florida excursion. “Can you repeat that?” I asked, taken aback, jotting down the words that felt more foreign in my mouth than Spanish. 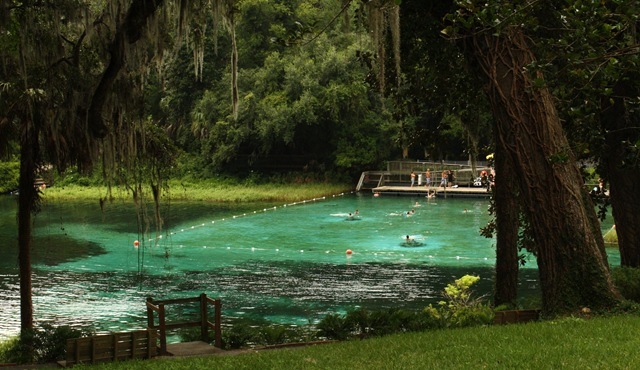 Throughout the months leading up to my trip, the words Cross Creek, Stumpknockers, Withlacoochee and Yankeetown continually circulated through my mind, and, like a magical incantation, conjured up the essence of Florida. Lurking in these visions was the gator. Part of this vision was culinary— I imagined I would certainly have another chance to eat gator after my dashed hopes on the shores of Lake Jesup (see last post). Yet the gator in my mind was not at all how one might envision the lobster, for instance, on an impending trip to Maine. While this makes me think I should learn more about the lobster, and should make the effort to be in awe of all animals that end up on my plate, it also highlights the fact that it takes no effort to fear the gator. Let’s face it – the gator is first and foremost a potential predator. 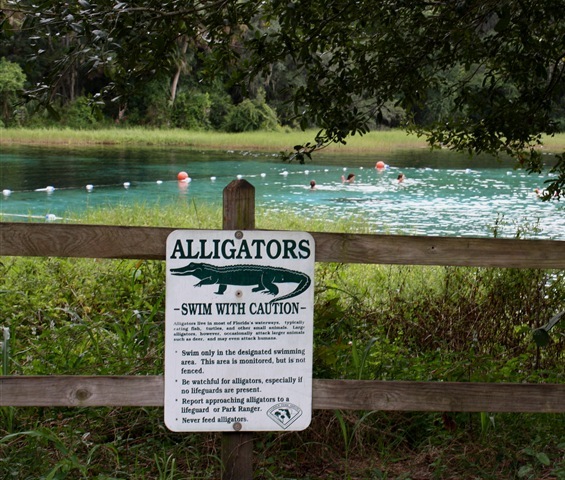 Growing up in Central Florida, surrounded by lakes, I learned early on that even land is not safe, as gators can overcome humans both in and out of water. From an enclosed back porch, I’d spend hours watching for and often spotting the many resident gators in the lake behind my father’s house. I admittedly never felt entirely secure in the backyard pool. At this time, gators were on the list of Endangered Species but steadily recovering, and my childhood was marked by their increasing presence rather than decline. They were removed from the list in 1987, when I was 13. This likely explains why I don’t have any early memories of eating gator, and helps to explain why food is often the last thing I think of when considering this imposing reptile. With all these former gator impressions swirling around in my head, I set off with my mom on our two-day excursion into Old Florida. The mosquitoes tried hard to get my attention, but the gator remained the ever-present, true protagonist of the journey. The Marjorie Kinnan Rawlings home in Cross Creek. Rawlings, known for her culinary skills, was particularly proud of her gator tail steaks. 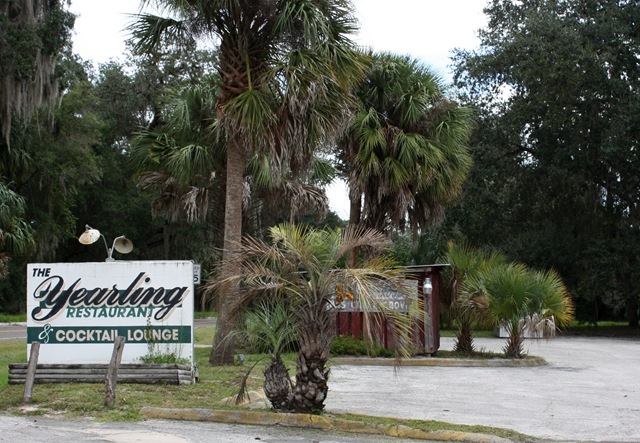 The Yearling Restaurant in Cross Creek, named after Rawlings’s Pulitzer Prize-winning novel, opened in 1952 while the author was still alive. Some of her specialties and favorite dishes are on the menu, like sour orange pie, prepared like the key lime version but with local sour oranges instead. I didn’t have to wait long to get my chance to eat gator, which was featured, no surprise, on the Yearling menu. 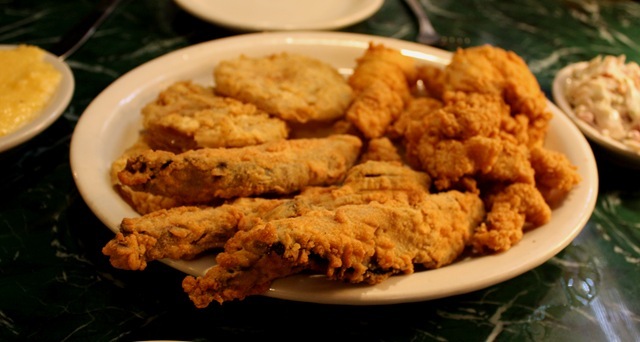 We ordered the Cracker Platter, which included fried gator bites as well as fried green tomatoes, frog legs and, rather mysteriously, portobello mushrooms. Conclusion: I cannot fully refute the common perception that gator tastes like chicken, although the psychological effect of knowing it is not chicken undermines the comparison in my opinion. 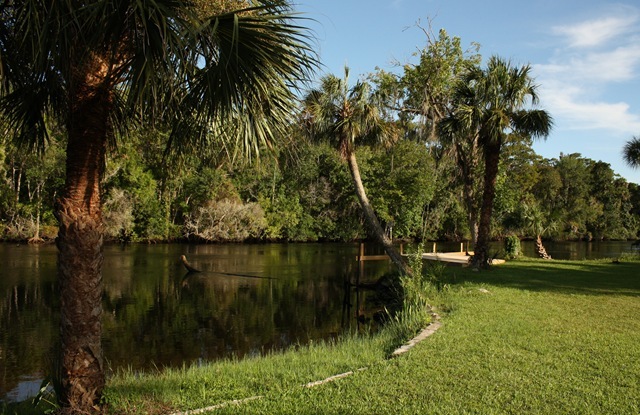 A view of the Withlacoochee River from our riverside efficiency in Yankeetown. This close to the Gulf of Mexico, the river maintains a steady flow in one direction or another depending on the tides. 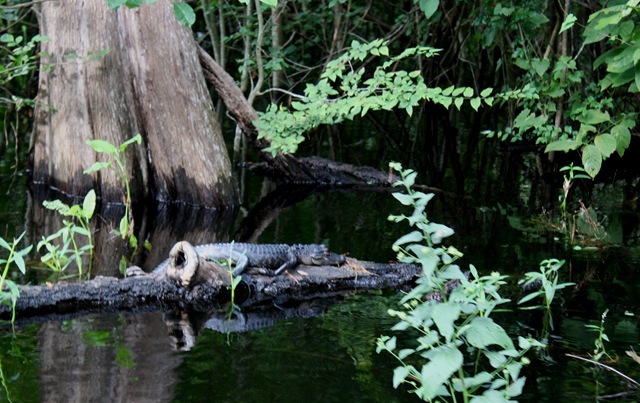 Wildlife abounds along this largely undeveloped river and swampy stretch of Gulf coast. From the back porch, I heard constant splashes from jumping fish and spied one midsize gator zipping by on a current. 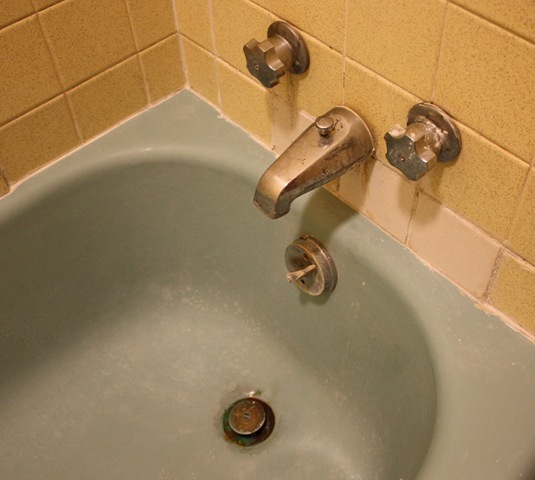 Despite the beauty of the surroundings, the interior of our riverside lodgings reminded me that “Old Florida” is not all charm, which is part of the adventure. We picked up Captain Mike’s Lazy River Cruise after a lunch of perfectly cooked peel-and-eat Gulf shrimp, meaty conch fritters and peanut butter pie at Stumpknockers Restaurant on the Withlacoochee River (these words maintain their magic even if they now roll off my tongue with ease). 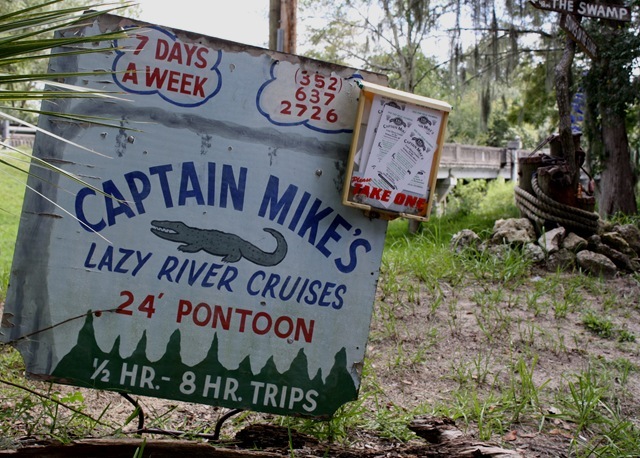 Captain Mike has been guiding pontoon boat trips down the tranquil and largely undeveloped Withlacoochee for fifteen years, leaving what he refers to as the St. Petersburg, FL “rat race” far behind. He is fine-tuned to any movement along the banks, and his commentary draws from a deep well of tales and facts about human and natural history along the river. We saw egrets, ibises and immature blue herons, and learned how tree frogs lay their eggs on the tips of leaves so the they fall into the water as they hatch. Our hopes for seeing a big gator were thwarted by two roaring airboats piloted by teenage boys, rupturing the evening calm. But Captain Mike, well-aware of his guests’ anticipations, knew all the spots a gator might be. On the home stretch of the cruise, Mike spotted this young gator sunning in the diffused evening light. The gator did not seem fazed by the paparazzi-worthy eagerness of the eight camera-wielding passengers, striving with our lenses to capture the spirit of Florida. I was thinking of you and the Winter Park crew as I wrote this — thank you for the inspiration!